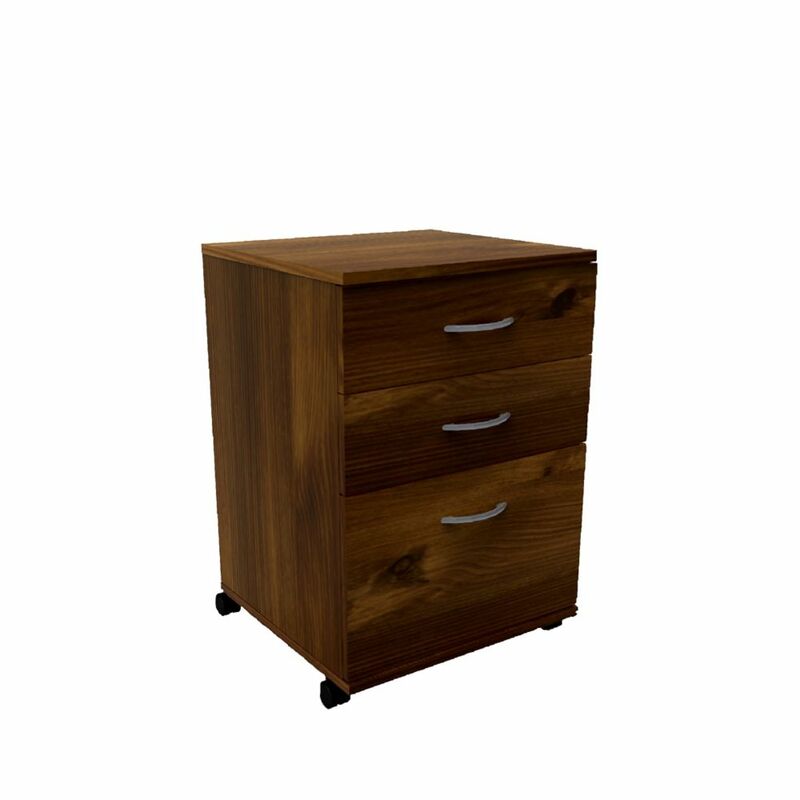 Essentials 18.63-inch x 26.63-inch x 17.63-inch 3-Drawer Manufactured Wood Filing Cabinet in Brown Perfect for your office, this manufactured wood filing cabinet from Nexera will keep your affairs in order. Safety and organization of your important documents are insured with this cabinet made out of manufactured wood. This handy filing cabinet makes it easy to free up your home or office from paper clutter. Essentials 18.63-inch x 26.63-inch x 17.63-inch 3-Drawer Manufactured Wood Filing Cabinet in Brown is rated 4.3 out of 5 by 3. Rated 5 out of 5 by Wanda from A solid, well made unit This is a very well made and nicely finished little piece of furniture. Assembly can easily be completed by one person if you take your time. Everything went together fine and fit properly. I would recommend that you drill small pilot holes when attaching the slides to the drawer bottoms, as the particle board will likely split if you simply force the wood screws in. Other than that assembly went exactly according to the instructions, which were clear and easy to follow. Do NOT use your handy dandy electric screwdriver/drill as you are guaranteed to strip some holes. The finished unit looks very nice. The drawers slide smoothly and it rolls around just fine. This is probably the best quality piece of flat-packed furniture I've bought to date. Rated 4 out of 5 by laura1234 from Smooth drawers and lovely colour! This cabinet serves our purpose of having a decently made 3-drawer space for our desk that includes a bottom drawer for filing. The drawers slide smoothly and is the colour and such it stated online. The one thing we didn't like was that the bottom piece wasn't stained so once put together you could see particle board, so we had to stain that ourselves. Rated 4 out of 5 by BigCat from Good looking, solid file cabinet Everything was as advertised. Relatively easy to assemble. The small screws used to attach the guide rails are a bit of a pain, which is why I gave it four stars not five.